The new method can be used to grow biological tissue or to create micro sensors. There are many ways to create three dimensional objects on a micrometer scale. But how can the chemical properties of a material be tuned at micrometer precision? Scientists at the Vienna University of Technology developed a method to attach molecules at exactly the right place. When biological tissue is grown, this method can allow the positioning of chemical signals, telling living cells where to attach. The new technique also holds promise for sensor technology: A tiny three dimensional “lab on a chip” could be created, in which accurately positioned molecules react with substances from the environment. “3D-photografting” is the name of the new method. Two research teams from the Vienna University of Technology collaborated closely to develop it: Professor Jürgen Stampfl’s materials science team and Professor Robert Liska’s research group for macromolecular chemistry. The scientists start with a so-called hydrogel – a material made of macromolecules, arranged in a loose meshwork. Between those molecules, large pores remain, through which other molecules or even cells can migrate. Specially selected molecules are introduced into the hydrogel meshwork, then certain points are irradiated with a laser beam. At the positions where the focused laser beam is most intense, a photochemically labile bond is broken. That way, highly reactive intermediates are created which locally attach to the hydrogel very quickly. The precision depends on the laser’s lens system, at the Vienna University of Technology a resolution of 4 µm could be obtained. “Much like an artist, placing colors at certain points of the canvas, we can place molecules in the hydrogel – but in three dimensions and with high precision”, says Aleksandr Ovsianikov. This method can be used to artificially grow biological tissue. Like a climbing plant clinging to a rack, cells need some scaffold at which they attach. In a natural tissue, the extracellular matrix does the trick by using specific amino acid sequences to signal the cells, where they are supposed to grow. In the lab, scientists are trying to use similar chemical signals. In various experiments, cell attachment could be guided on two dimensional surfaces, but in order to grow larger tissues with a specific inner structure (such as capillaries), a truly three dimensional technique is required. Depending on the application, different molecules can be used. 3D photografting is not only useful for bio-engineering but also for other fields, such as photovoltaics or sensor technology. In a very small space, molecules can be positioned which attach to specific chemical substances and allow their detection. 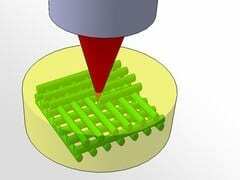 A microscopic three-dimensional “lab on a chip” becomes possible.